Your beer and your bud have more in common than just "things you enjoyed in college." 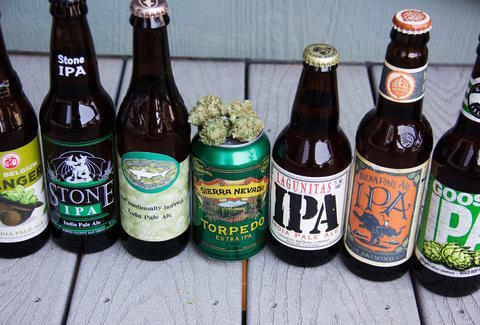 Both have myrcene, the compound that gives cannabis that "musky earth [smell] that fills your nostrils," and it's also prevalent in the hops in IPAs. We learned that interesting nugget (!!) from Philip Wolf of Cultivating Spirits, a Colorado-based company that provides a "sophisticated cannabis experience," including tours and three-course meals paired deliciously with cannabis. Because sometimes pairing rich imperial stouts with desserts gets old, we asked Wolf to pair some of our favorite IPAs with strains that complement the beer. Let's cultivate some spirits, shall we? "The high amounts of linalool and limonene you taste on the inhalation of Tangerine X Flo harmonizes perfectly with the the lemon zest you taste as this IPA hits your tongue. 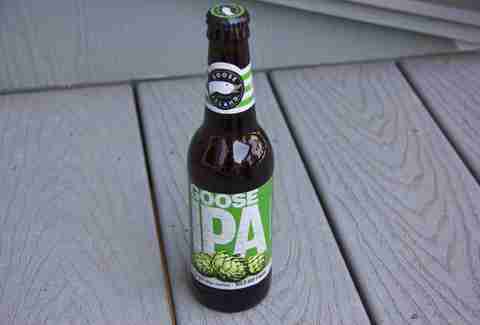 The skunky apricot aftertaste from this Goose IPA transforms your mouth just like the earthy transformation your taste buds feel on the exhalation of the Tang X Flo." "The 60 Minute IPA reminded me of eating clementines at a bluegrass festival, and was the sweetest, smoothest, and lightest out of all of the beers I tried for this story. Sweetness, smoothness, and lightness is exactly what pops in my head whenever I smoke Blueberry Haze." "Out of all the pairings, this was the hardest. The dry, bitter, pine taste of the Stone was a little confusing for my mouth to pick up on, just like the musky, citrus, diesel taste of Bio-Diesel. Think about Ethiopian coffee the morning after a night of celebrating too hard." "White Widow is one of the heaviest-hitting indicas on the planet with its high levels of caryophyllene and myrcene. The smokey and earthy tastes you get from those terpenes will go perfectly with Torpedo, which reminds me of those dark organic chocolate bars I love so much -- 80% cacao anyone?" 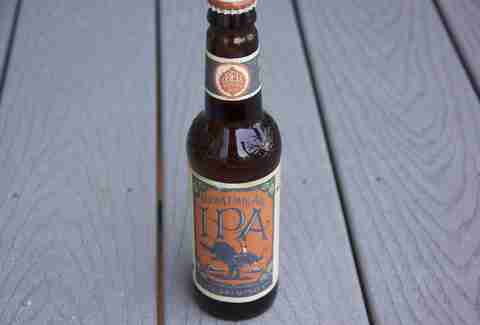 "I could never conceptualize 'sun-kissed' until I tried this IPA. This will go perfect with Agent Orange for obvious reasons!" "What a perfect pairing! The harmonization of the lemongrass taste of Lagunitas is perfect with the sage you taste in, well, SAGE. The spicy aftertaste from the caryophyllene reminds you of the bitterness you feel in your mouth a few seconds after the beer goes down the hatch. Harmonization at its finest!" "Ranger IPA is one of the few beers I’ve had that holds a similar flavor from start to finish. The crispness of the sour/citrus profiles goes perfect with the clean lemon taste of Golden Goat. Perfect for a Colorado river trip!" Jon Sumpson writes about marijuana for Thrillist and thinks most things pair well with cannabis.